At the strike of midnight on September 30th, we begin the excited preparations for Halloween. It’s a long month of discussing, analyzing, and comparing costume choices; putting up decorations; watching Halloween TV specials (we own It’s the Great Pumpkin, Charlie Brown) and reading our favorite books, most notably Jerry Seinfeld’s Halloween. Both kids can now recite the Halloween Three-Step Program by heart. And of course, there’s the pumpkin picking. This year, we’re going to make Jack O’Lanterns, so inspired are we from going to the Great Jack O’Lantern Blaze. So this year, we went to get our pumpkins about an hour away, on Kelder’s Farm in Kerhonkson, NY. We’ve been there to see Chomsky once before, but it was in March when the farm stand wasn’t open. 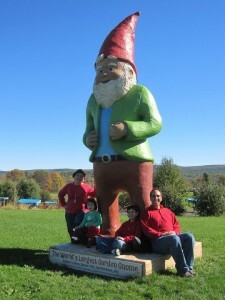 We went to get a better look at the world’s second largest garden gnome, with the added benefit of getting our pumpkins and having some fun on the farm.